It's been quite a while since I'd seen The Frighteners from beginning to end, but after watching it last night, time seems to be kinder to it than I remembered. The first time I saw The Frighteners was sometime in 1996, when my dad took me out to the Colony in Raleigh (the only theater playing it as I recall) to see Michael J. Fox's comedy horror epic. I don't really think I knew who Peter Jackson was at the time; I certainly hadn't seen Bad Taste, Dead Alive, or Heavenly Creatures, but I knew about Meet the Feebles (the most demented puppet movie not this side of Jan Svankmajer) and was probably seeing it soon. I was thinking The Frighteners would be something along the lines of Ghostbusters, since the ads play up the humor. Clearly, I was mistaken. I remember liking The Frighteners, although the mix of humor to horror tended to lean heavily in one direction or the other for long periods of time, and the hell worm eating Johnny and Patricia (Jake Busey and Dee Wallace-Stone) really disturbed me at the time. 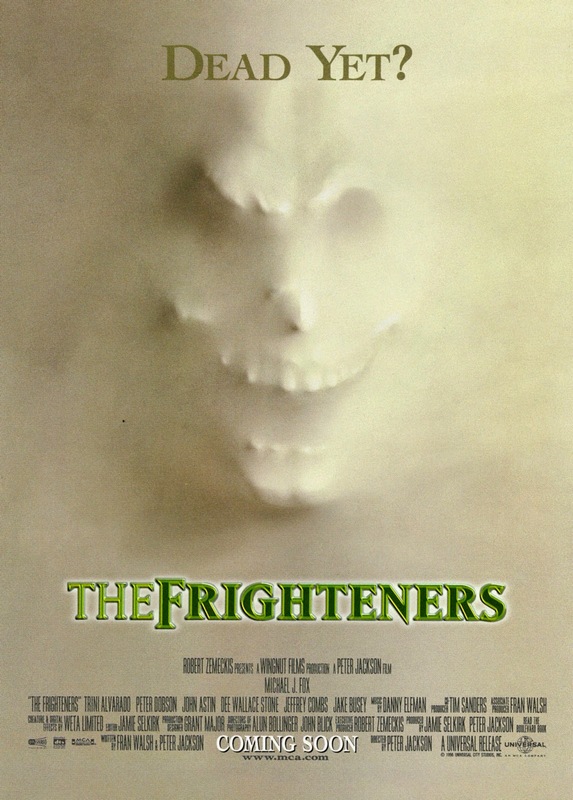 Critics seemed to take exception to a horror comedy that was more horror than comedy, and to this day The Frighteners is regarded as a misfire for Peter Jackson. Looking back at it, I'm not so sure. Yes, the film is marketed as a comedy, and yes, it's not a comedy in the sense that Ghostbusters is, or even Dead Alive, which took gore to such extreme lengths that one couldn't help but laugh. The horror in The Frighteners is unabashed; characters we care about are murdered wantonly by the Soul Collector, and the gore is often more disturbing than laughable (with the notable exception of Jim Fyfe and Chi McBride's ghosts in the first act, where gore is played for laughs). Jackson pulls the rug out from under us, setting us up for a funny romp and then turning things dark very quickly. That being said, it still works if you know what you're getting into. Even having not seen it in years, I knew The Frighteners was a horror-comedy that leans more in one direction than the other, and when weighed with what Jackson's done before and since, the movie give us a glimpse of a director moving from one type of film to another. For The Frighteners, Jackson really relied on the still fresh WETA team to use what computers could do in 1995 to make the ghosts seem real in the film, and because of what they accomplished, he felt comfortable enough to consider making The Lord of the Rings next. Frighteners was also Jackson's first major studio picture with an "A List" Star (bear in mind that Kate Winslet was an unknown when Heavenly Creatures came out and had not yet appeared in Hamlet or Titanic) and a large budget. For a director accustomed to low budget movies, this was a high concept film, and Jackson's brand of black comedy was a little darker than most American audiences were ready for. Uneven as it may be, The Frighteners is still fun to watch, and as the last major starring role for Michael J. Fox as Frank Bannister, a time capsule of an actor still in his prime. It also has a fine supporting cast, with Trini Alvarado, the aforementioned Busey and Wallace Stone, Fyfe, McBride, John Astin, and Jeffrey Combs playing the most demented FBI agent you're likely to see. Oh, and let's not forget that extended cameo from R. Lee Ermey, basically reprising his role in Full Metal Jacket. The version I watched was the extended Director's Cut, which runs a little over two hours and adds fourteen minutes back into the running time. A few sequences seemed new (like the ghosts dressing up as The Grim Reaper to scare Frank and more flashback material of Johnny and Patricia) but for the most part I can't really remember what was new and what wasn't. The Frighteners is unfairly maligned in the Peter Jackson filmography, and certainly worth another look. You might be surprised that is still holds up, or that Jackson went from this directly into Lord of the Rings, but a watered down PJ film this is not.